Welcome to another installment of a segment where we dive into one Elder Scrolls Online’s many Sets, and explore what sort of Builds you can make. Not only will we show you how to get the most from these Sets, but we’ll explain where to get them, what requirements there are to obtain them (if any), and everything else you could possibly want to know about them. 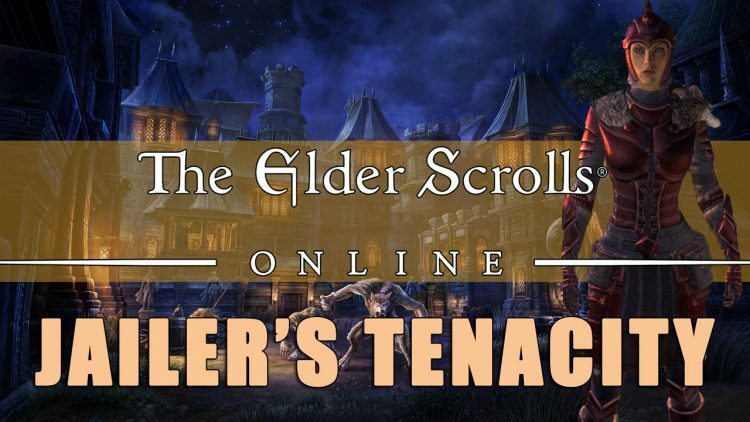 This week’s Set should see a some niche play in Cyrodiil, Battlegrounds and Dungeons as well: Jailer’s Tenacity. The 2,4, and 5 piece bonuses never change despite level and quality. This Set was added to the game with Update 19 Wolfhunter, which launched in August of 2018. The biggest changes to come with this Update were to Werewolves and the nerfing of Snaring and Defiling effects (which makes this Set that much stronger). Jailer’s Tenacity can be obtained by running the 4-man Dungeon Moon Hunter Keep, which requires the Wolfhunter DLC as this Set is bind-on-pickup and cannot be acquired from other players. The Style of this Set is Silver Dawn, which will be obtainable in Update 20, when its Motifs are added to the drop pool of the Moon Hunter Keep final boss on Veteran difficulty. Since this is a Dungeon Set, you can get Weapons, Shields, Armor and Jewelry, but the Armor will always come in Heavy. The Traits on this Armor are random, so you may have to farm several times in order to get the ones that you need, but the Jewelry for this Set comes with the Healthy Trait. 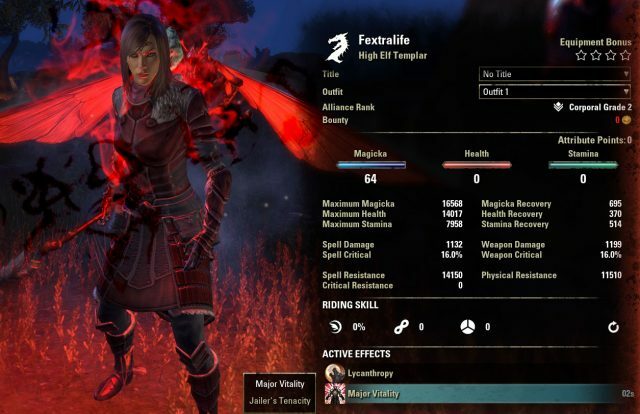 Keep in mind that you can use Transmutation to change Traits if you wish, but you will need the Summerset expansion if you wish to Transmute Jewelry. Jailer’s Tenacity grants you Major Vitality when struck for 7000 of your Damage. The 2,4 and 5 piece bonuses on this Set do not change no matter the quality of the items worn, which makes upgrading it to Legendary almost useless except for improving your Traits. Consider leaving it at Epic for this reason to save money on materials, and use them for something that gives you more of a benefit. Please note, however, that you can extend the duration to 8.4 seconds by equipping the Jorvuld’s Guidance Set. What the buff looks like on your character sheet. Jailer’s Tenacity increases survivability by increasing the amount of Healing Received you take. This is one factor involved in calculating total healing, but there are others such as Healing Done and Healing Taken (which is also present on the Set). There isn’t a lot of information out there on how this all works, so I’ll note it here for convenience. The formula to figure out how much healing you will get is as follows. Note that Healing Done, Healing Taken and Healing Received all affect the healing of Potions as well. Let’s say you want to calculate how much healing Breath of Life would heal you with a tooltip value of 7703. Let’s say your Healing Done is 25%, your Healing Taken is 16% (from Jailer’s Tenacity and Rapid Mending) and your Healing Received is +30%, since you were hit for a quarter of your Health in one attack. You would take 7703 * 1.16 * 1.30 and you would get 11616. You do not need to factor in Healing Done here, as the game already does that for you on the tooltip. Because of the way this calculation is done, if you are wearing 5 Heavy Armor pieces of this Set when you trigger Major Vitality, you will essentially gain +50% healing from all sources for 6 seconds, which is significant. Minor Vitality – There are many Skills that provide this bonus, a long with one Set. Major Vitality – There are a few Skills that provide this bonus, and this Set. Any points placed into Blessed will be reflected in the tooltip of any Skill that heals. How Jailer’s Tenacity works is: whenever you take 700 damage damage in a single attack you gain Major Vitality for 6 seconds. In order for this Set to trigger Major Vitality you must take 7000 damage directly to your Health. Even if you take what would have been 7000 damage of your Health to your Damage Shield, for example, it will not trigger the effect. You can see from the GIF that you don’t trigger the Major Vitality with a Damage Shield present, unless you take 25% to your direct Health. One really important factor in making this Set useful is that it does not have a cooldown and can you can refresh the 6 seconds of Major Vitality while you already have it active. This makes it extremely useful for situations where you are getting struck hard and fast, because you will be able to heal for much more until the pressure has subsided. This usually occurs in PvP scenarios, Dungeons or Trials (if you’re the tank), making this Set useful to a range of different players. This Set is really only useful for the Tank role because the bonuses are Health, Healing Taken and Healing Received. While most Tanks usually shy away from these type of bonuses in favor of flashier ones, the 5 piece is extremely strong, and may prevent you from dying against certain encounters where you are taking a lot of damage while getting hit by a boss. When you factor in the Healing Done your healer will have on top of your Major Vitality, it should be extremely easy for your healer to keep you alive, assuming you don’t get one-shotted. Because you will benefit a lot from healing, it is advised that you take a second Set that provides some. 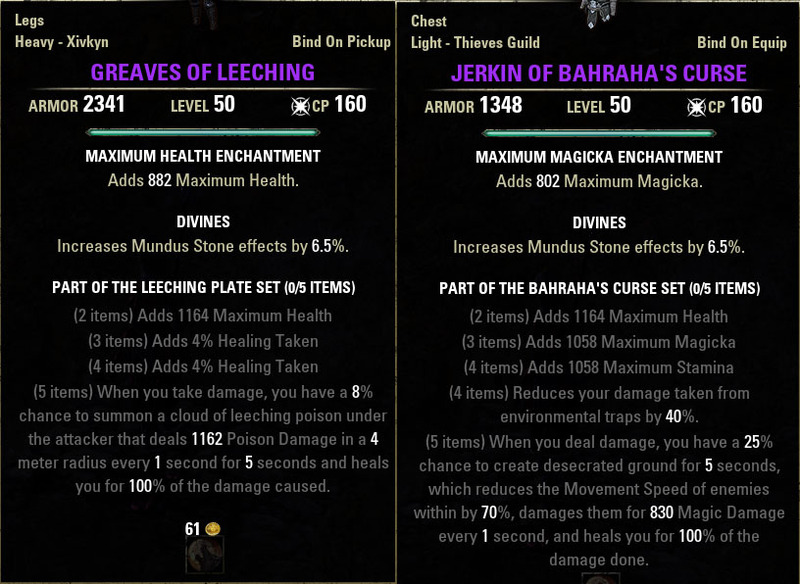 Bahraha’s Curse and Leeching Plate are both solid choices here as they provide a lot of healing, and Livewire is also not a bad third option either. Two excellent Sets that take advantage of the increased healing of Jailer’s Tenacity. If you’re playing a Stamina Tank consider using Sentinel of Rkugamz for the HoT and Stamina return, or Swarm Mothers to help group enemies together from more effective healing from one of the above Sets. If you’re playing a Magicka Tank consider using Chokethorn or Nightflame for the extra healing. Because you get hit for 25% of your Max Health often in PvP, which can often lead to your death due to lag or poor timing, Jailer’s Tenacity can help keep you alive when you should be dead. Imagine being jumped by a Nightblade from Stealth and being able to gain an extra +30% Healing Received until you could recover and go on the offensive. Or, if you’re more of a Tank out in Cyrodiil, being able to use something like Inhale or Dragon Blood to much greater effect. Consider this Set if you need more survivability and you don’t rely on Damage Shields. This Set performs really well for Builds that DPS while healing at the same time. 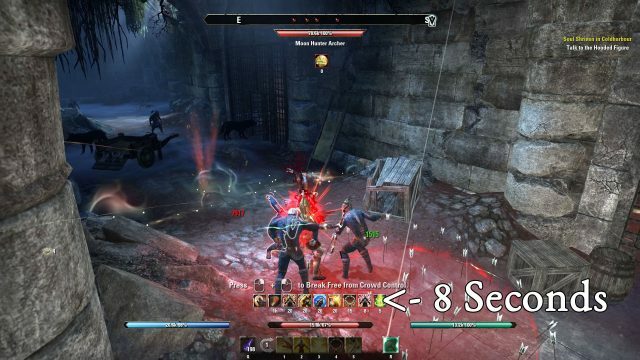 When you are dueling or in small scale PvP, you don’t want to be forced to your back bar, so this Set can be a life saver when mashing something like Puncturing Sweep or Swallow Soul. It also works well on Stamina Builds because of their constant HoTs from Rally and Vigor, which only get stronger if they get hit hard. Skills like Puncturing Sweep work extremely well with this Set in PvP because of the healing you gain while dealing damage. PvP gives you -50% Healing Received just for playing, so this Set can nearly offset that between the Healing Taken (+8%) and Major Vitality (+30%). 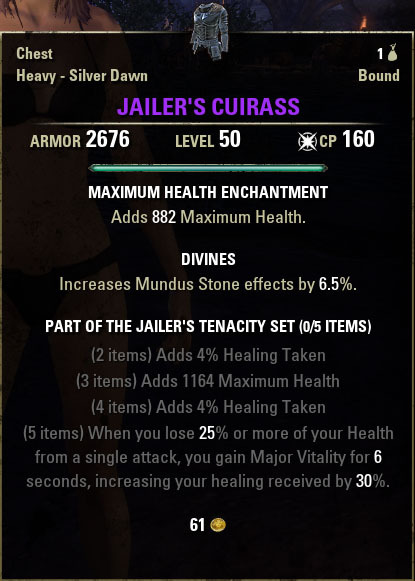 This means when this Set procs you’ll be receiving nearly full value on your healing while in Cyrodiil which is something you can’t otherwise do unless you use very specific Potions. Also factor in that the Set has no cooldown and you can keep this up relatively often while in larger battles. Just be sure that you have a healer or two handy. This Set is not recommended for players who stack Damage Shields because you will not gain Major Vitality unless you actually take 7000 damage to your Health in a single hit. So if you’re a shield stacking Tank or any sort of bubble player in PvP then you will most likely want to look elsewhere in terms of gear. As mentioned earlier, Jorvuld’s Guidance does increase the duration of Major Vitality by 2.4s to 8.4s. 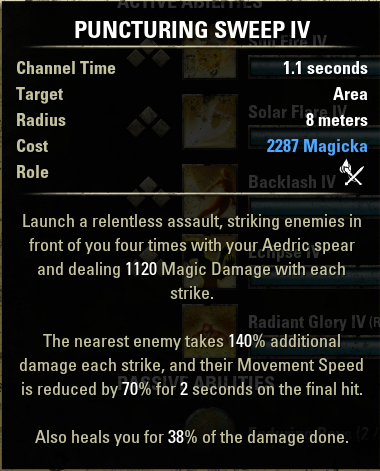 While this isn’t overly useful to a Stamina Tank, it can work very well for a Magicka one because Bosses usually have specific rotations, and this may be able to extend your up time long enough to power through its hardest hitting attacks. Keep in mind that it will extend the duration of other buffs you apply as well, so you can get a lot of mileage out of this combination. Jorvuld’s Guidance will increase the duration of Major Vitality by 2.4s to 8.4s. Be sure to place a significant amount of points into Quick Recovery and/or Blessed in order to maximize your healing with this Set. Quick Recovery will further increase the healing you receive from all sources, so works best on a Tank. Blessed is more useful in PvP, but can also help in PvE if you tend to heal yourself as a Tank and are using any of the Sets I recommended above. Stay tuned as I’ll be covering the rest of the Wolfhunter’s Sets, and be sure to check out our other ESO Guides!